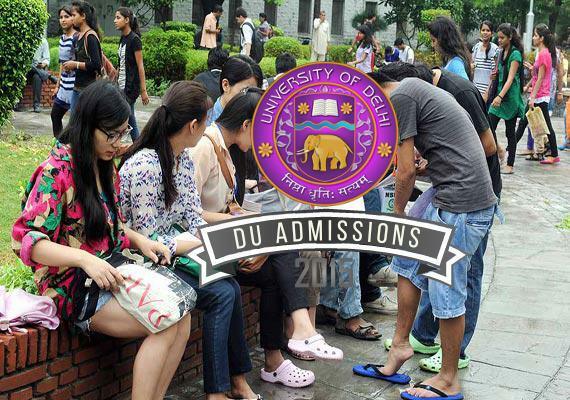 New Delhi, July 1 : The Delhi University colleges have announced their second cut-offs for this admission season with the top colleges still trading in the above-90 realm for more popular courses. In the announcement made late Friday night, Hansraj and Hindu College lowered their Economic (Honours) cut-off to 97 and 97.25 per cent respectively, down from earlier 97.50 per cent. Shri Ram College of Commerce (SRCC), releasing its second cut-off a little earlier than the rest, declared admission closed in its Economics (Honours) course. Reducing its cut-off by 0.25 per cent for B.com (Honours), it kept admission open in the course at 97.5 per cent. Economic (Honours) remained in high demand, with at least four colleges– Miranda, Kirori Mal, Venkateswara, and Shri Guru Teg Bhadur (SGTB) Khalsa — anchoring their cut-offs hardly any lower at 96.75 per cent. Throwing a surprise with a 99.66 per cent cut-off in B.Sc. (Electronics) course first time around, SGTB Khalsa brought it down sharply to 96 per cent in the second cut-off. Similar reduction was seen in its Political Science course, which was pegged at 99 per cent in first cut-off, which came down to 97.25 per cent. Lady Shri Ram (LSR) College’s psychology course remained pricey at 98.25 per cent. It relented its journalism cut-off by 0.25 per cent and pegged it at 97.75. English and Political Science cut-off here remained still high at 97.5 per cent for both courses. It closed admissions for: Economics (Honours), History, Philosophy, Sociology, Maths, Statistics and B.Com (Honours). Hindu College closed admissions for B.A. (Programme), Political Science, Chemistry, Physics, Zoology, Botany and Statistics, among other courses. Earlier at 97 per cent, the Delhi College of Arts and Commerce reduced its cut-off to 96.5 per cent for the course of Journalism, similar to Kamla Nehru College’s in the same course. The journalism cut-off for off-campus Maharaja Agrasen and Kalindi College settled at 93.5 and 94 per cent. Candidates who meet these cut-offs can seek admissions in colleges till July 4 with required documents.